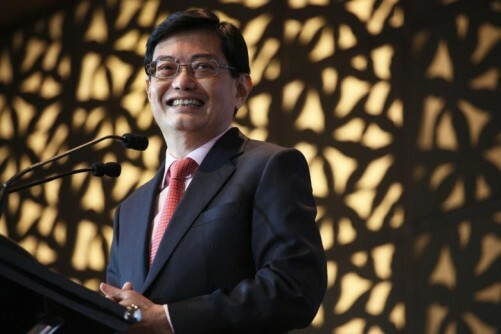 Learning before starting work is the norm, but Singaporeans should embrace a new approach of "learning while doing" that allows them to keep up with technology and fast- changing workplaces, Finance Minister Heng Swee Keat said last night. He noted that the world is being roiled by major structural changes, but Singapore will be well placed to meet the challenges if firms and individuals can adapt quickly enough and build up strong capabilities. Mr Heng, speaking at the Economic Society of Singapore annual dinner at Mandarin Orchard hotel, said the global economy is increasingly uncertain and the pace of technological change is picking up. He highlighted several key trends, including the impact of technology on productivity and jobs, the rise of emerging economies and the growing importance of data. When the Committee on the Future Economy - a panel co-chaired by Mr Heng and tasked with charting a blueprint for Singapore's future growth - considered these trends last year, "there were some who sought to bet on new growth industries, new technologies and new markets to go into. But in a fast- changing, unpredictable world, there are no shortcuts", he said. These shifts mean companies, individuals and institutes of higher learning need to change their habits and practices significantly. For workers, this means shifting from "learning, then doing" to "lifelong learning and doing", Mr Heng said. "Throughout our careers, we learn the skills that we need for our jobs, hone them by using them at work and then, as the economy evolves, learn a new set of skills and in turn put those to use. It is a virtuous cycle of learning and doing." In addition to skills relevant to their industries, individuals must also pick up general skills like the ability to work with digital tools and data. Learning does not need to happen only in classrooms - it can take place online or through on-the-job training and overseas attachments. Also, learning need not take place only in a person's early life. "Instead, we should learn throughout life, through on-the-job experience interspersed with bouts of more intense, modular full-time training," said Mr Heng. Companies also have a role to play in positioning Singapore for a volatile, uncertain future - through innovation and overseas expansion, as well as building up deep industry- specific capabilities. These involve firms collaborating to develop new technologies and share resources. Mr Heng said government agencies are also looking into providing more integrated support to companies in areas such as helping firms build capabilities and venture overseas. He added: "There is no playbook to follow. What we need is the right mindset - to be proactive, dare to take risks and learn from our failures, and recognise that this is a continuous journey of upgrading." Mr Heng took questions from the audience after his speech, including one about whether he is happy with Singapore's economic growth. Singapore's economy grew 2.5 per cent in the second quarter compared with a year earlier. To laughter from the floor, Mr Heng said he "could be happier", pointing out that Singapore - as well as many other countries around the world - continues to struggle with raising labour productivity. He noted that productivity will become increasingly important for sustainable long-term economic growth, especially since the labour force will no longer expand as quickly as it used to. The Industry Transformation Maps - industry-specific road maps that aim to transform key sectors of Singapore's economy - are among ways that the Government is trying to address the country's productivity shortfall, said the minister.